Snapping the perfect selfie is harder than it looks — especially in low or unnatural light. With the help of a selfie light, you can brighten things up so that your selfies never look dull, shadowy, grainy... or just downright unflattering! Selfie lights can help you up your Snapchat or Facebook game without adding any post processing work. Selfie lights can be attached to any iPhone or Android phone no matter who made your Android phone: Samsung, Google, Huawei, Xiaomi, etc. What Is a Selfie Light? A selfie light is a specific type of light fixture that you can either set up somewhere in front of yourself or attach to your smartphone. The ones that you set up in front yourself are usually just standard ring lights. The ones that attach to your phone typically come in the form of miniature ring lights that encircle the front-facing camera or special phone cases where the sides (or entire perimeter) of the case light up. Standard ring lights are not just for selfies and have long been used by professional photographers. A flash is mounted in a circular ring with a hollow center, which may or may not come with its own stand. If it doesn't come with a stand, it can usually be mounted to a tripod. Your smartphone or camera device then sits in the middle of the ring so your selfie is setup under uniform lighting. 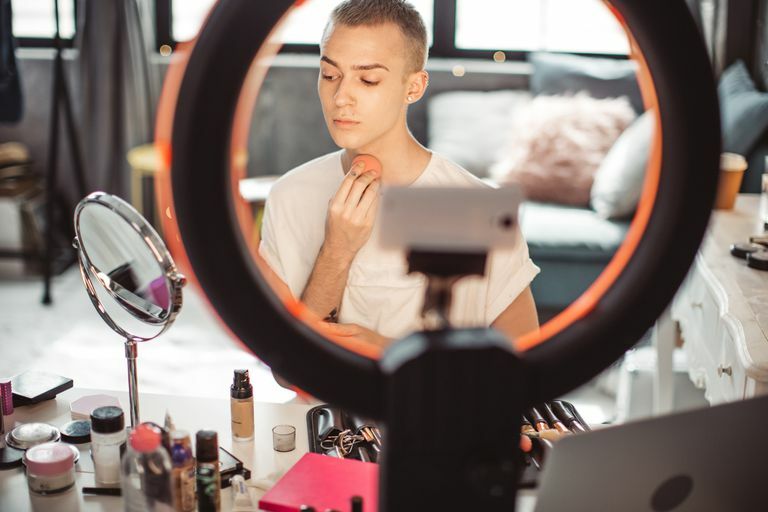 The standard ring light is ideal for makeup artists and other creative types who want to showcase their skills without having to physically hold their device. Whether you want to strike a super unique pose or film a tutorial on how to apply winged eyeliner, a standard ring light is best because it frees up your hands. The one major downside is that a standard is much larger and therefore far less convenient than one that attaches to your phone. They can also be pretty pricey depending on which one you go for. Attachable selfie ring lights are just like standard ring lights, but much smaller in size and without a stand or a tripod. They clip on to the top part of your device so that the camera sensors are encircled. Attachable selfie right lights are ideal for people who prefer to take more casual selfies and don't mind using their hand to hold up their device. Since they're smaller in size, they're more portable and often more cost effective than standard ring lights. Illuminated phone cases take the ring light to a whole new level. This is a phone case that has a light surrounding the edges of the screen. If you want your selfie light to be as discreet and as easily accessible as possible, the illuminated phone case is for you. Since it's an actual case, you can keep it on your phone—making it the most convenient selfie light options of them all. Unfortunately, illuminated phone cases don't offer the same protection as protective cases, so they won't save your device from being dropped. These are very basic instructions for how to use a standard ring light and will vary depending on the type of ring light you have. Refer to the instructions for your specific ring light to get it all assembled. You might need to attach it securely to a separate tripod if it doesn't come with its own tripod or stand. Place the ring light stand or tripod on a sturdy surface and adjust the height of it. Attach your smartphone to the center part of the stand or tripod so that it's entirely encircled by the light. Positioning it in portrait or landscape mode is completely up to you. The traditional way to use a ring light is to place your device inside the ring, but some people like to experiment with lighting angles by positioning their device or camera to the side. Open any selfie or camera app to test the view and readjust the height if necessary. Turn the ring light on and use the dimmer to adjust the brightness. Attachable ring lights and illuminated phone cases all vary in design and functionality depending on which one you get and perhaps which device it works on (iOS or Android), so the following instructions may or may not apply to yours. Refer to the instructions for your specific attachable ring light or illuminated phone case. In most cases, you should easily be able to clip an attachable right light onto your device or secure an illuminated phone case onto it just like any other phone case. Open any selfie or camera app to test the view. Use the dimmer to dim or brighten the light. Try holding your device from different angles, such as from the left, from the right, from the top, from the top-left, from the top right and so on. Consider using a selfie stick to get a farther shot or a tripod if you'd like to go hands free. Don't forget to charge the battery of your attachable ring light or illuminated case when the battery gets low.